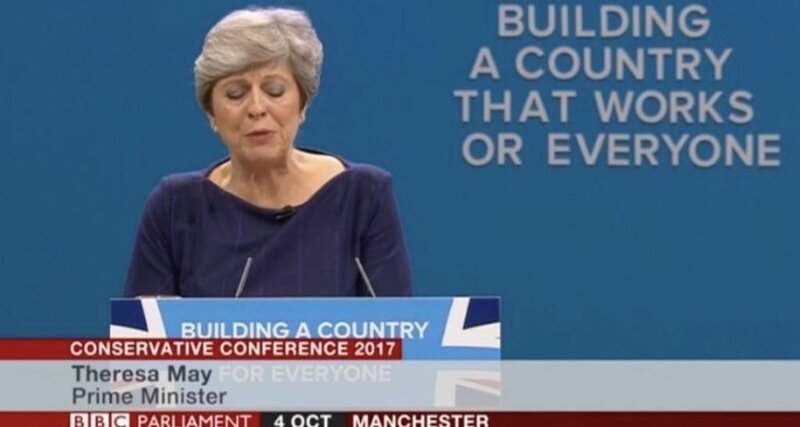 Among supporters of Brexit there is much talk about “global Britain” and “taking back control”, but in reality what do these statements actually mean? Will the UK benefit from higher economic growth or save any money from leaving the EU? Here we examine the evidence behind ten claims that the Leave campaign made to convince people that it was a beneficial to vote for Brexit. 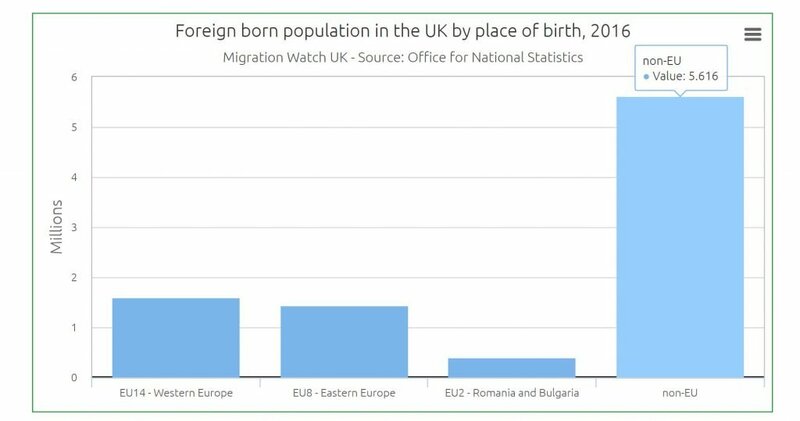 Two thirds of net immigration into the UK comes from outside the EU and so leaving the EU will only help us control a minority of UK immigration. The Office of National Statistics estimates that in 2016 there were 9.2 million (14% of the population) people living in the UK who were born abroad. However, only 3.5 million were from countries now in the EU. So, how does leaving the EU help reduce non-EU immigration? 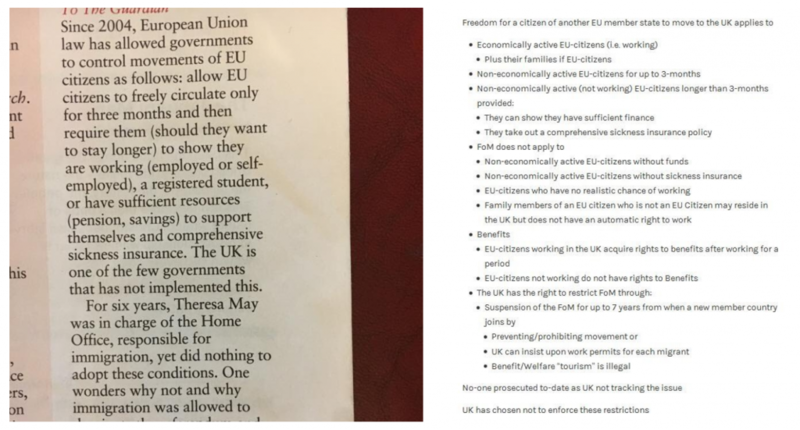 In respect of EU immigration, the UK has powers to send back EU citizens after 3 months if they can’t prove they have a job or means to avoid having to claim state benefits. The government has failed to implement these powers, but that’s not the fault of the EU. All free trade agreements with countries almost always include a relaxation in barriers to immigration from the countries involved (see quote above about India). This means that Brexit is likely to increase immigration from outside the EU. Is that what Leavers want? 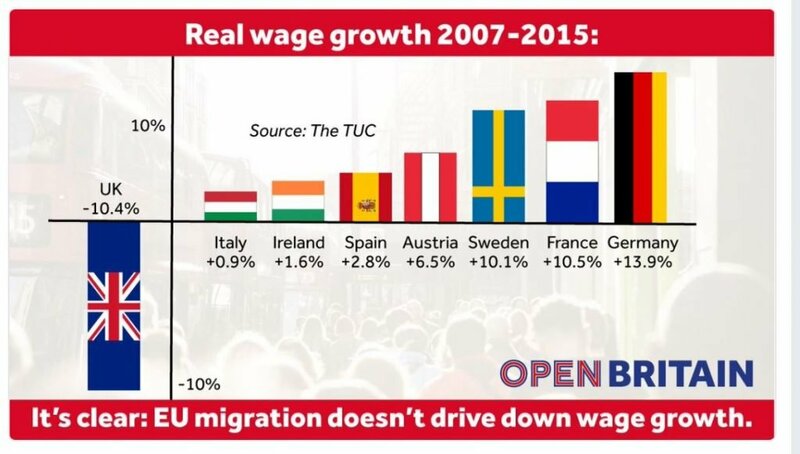 The evidence also suggests that mass immigration from the EU has boosted economic growth in the UK and has not reduced wages. Germany has had by far the biggest influx of migrants in recent years and yet it has seen solid growth in incomes. If the UK has completely open borders as the Leave campaign suggest, why are there immigrants in France trying to smuggle their way across the English Channel? This is because the UK is not in the Schengen area which consists of 26 European countries (of which 22 are EU states). The Schengen area allows EU citizens or people with a Schengen visa to cross internal the borders of the countries in the area without the need for border controls. However, because the UK (and Republic of Ireland) are not in the Schengen area the UK does have ability to check passports and exclude people form entering the country from other EU member states. However, until recently it has been the UK Government’s policy not to record when people leave the country and so this has prevented greater immigration controls. The EU’s freedom of movement of people is largely a myth as people do not have the right to permanently move to another EU country unless they can can prove they have work within three months of arrival or they have money and private medical insurance to ensure they are not a drain on their host country. Free trade agreements are based upon the harmonisation of standards and regulations. As a member of the EU the UK currently has the ability to influence and shapes all new regulations and rules for our largest export market. This will end when the UK leaves the EU and yet if we wish to continue to trade with the EU we will still have to comply with EU regulations and submit products to EU regulators for approval. How does this benefit the UK? Theresa May has indicated that the UK does not have the time or expertise to replace the multitude of EU regulators within the 2 year negotiating period. This means the UK will continue to have to comply with most EU regulators even after 2019 and will have to contribute to the cost of the EU regulators. How can this be seen as “taking back control”? Even if in time the UK does replace EU regulators, UK companies will have to continue to conform to EU rules and standards if they still want to sell their goods and services into EU member countries. If the UK changes its own regulations companies based in the UK would then have two sets of regulations to follow. How would this reduce red-tape? When the UK leaves the EU London will also lose two key EU regulators that are based in London (The European Medical Agency and European Banking Agency). This will result in over 1,000 highly paid and influential jobs leaving the UK. How is this beneficial? In the Brexit White Paper triggering Article we were told that parliament has “remained sovereign throughout our membership to the EU” despite the public “not always feeling like that”. This completely contradicts the argument of the Leave campaign that we had lost sovereignty to the EU. Indeed, most UK laws are set by the British Parliament and not the EU and we have negotiated opt-outs for many EU laws and regulations. 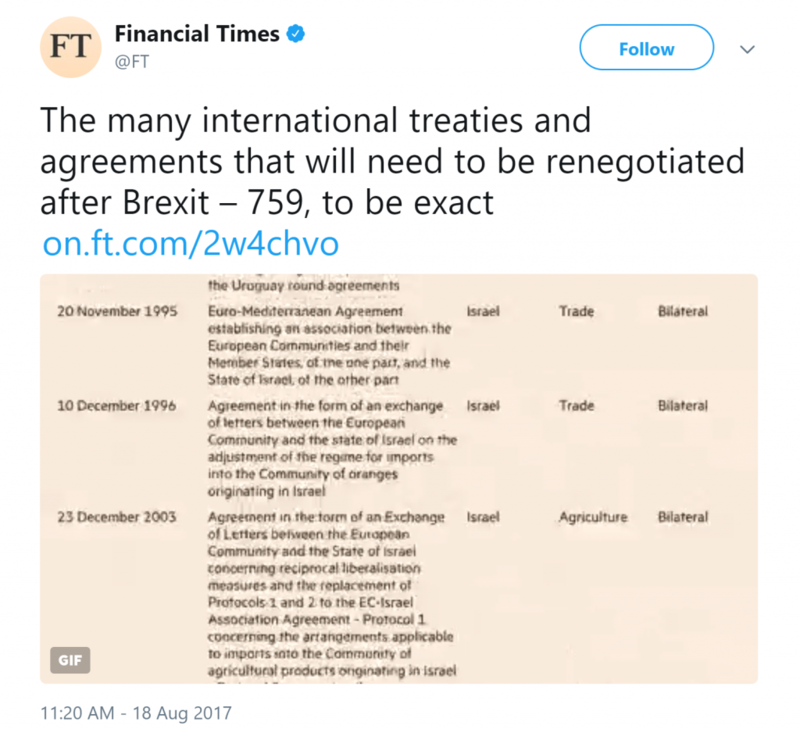 The notion of “taking back control” also ignores the policy that successive UK governments have decided to pool some aspects of the country’s sovereignty to achieve national objectives that would have otherwise not been achievable, such as creating the single market and helping to construct the EU climate change strategy. 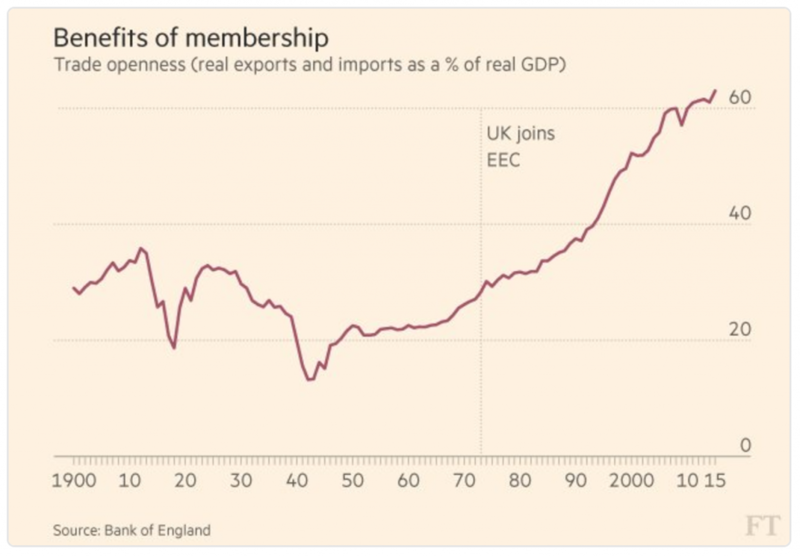 The world is also much more interdependent today than when we joined the EEC in 1973. In today’s world the only country with ‘absolute’ sovereignty is North Korea and so this concept is illusory. What good is extra sovereignty if it reduces our ability to ensure the prosperity and security of the UK? 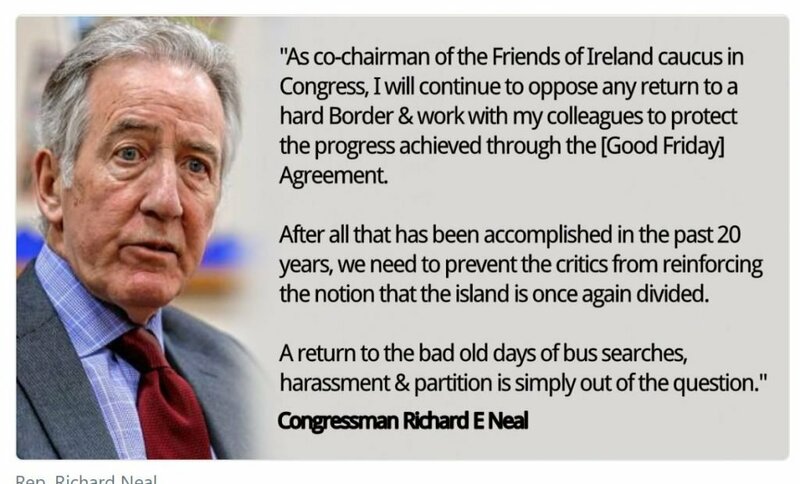 All parties involved in the Northern Ireland peace process accept that the introduction of a hard border with the Republic of Ireland would threaten the current peace. The main reason why there is currently no hard border between Northern Ireland and the Republic of Ireland is because both are in the single market and customs union. Further, neither are in the Schengen area and so Northern Ireland is protected by borders in the Republic of Ireland and the rest of the UK. The Good Friday Agreement was drawn up on the basis that both countries would remain in the EU and so it does not allow for the possibility of one or both the parties leaving the single market and customs union. The concept of a high-tech border (Max Fac) for vehicles and goods has been proposed by the government, but this relies on technology that has not yet been invented. However, if there was such a solution surely other countries would have adopted such a system. Indeed, no other border in the world that is outside of the single market uses technology that allows for frictionless trade. Having an open border on the island of Ireland also completely ignores the movement of people across the border and would attract people smugglers and would undermine immigration controls the UK government claims it wants to implement. If the UK government ever tried to undermine the Good Friday Agreement it is likely that the US would intervene because of their close links and involvement with the peace process in Northern Ireland. 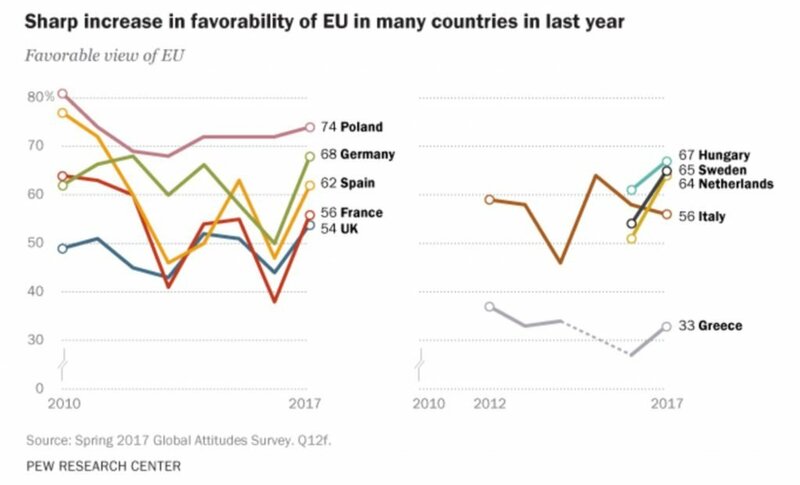 If the EU is that unpopular why don’t we see major parties in other EU countries asking for a referendum to leave the EU? The population of Greece, which by any standards has had the roughest of times of any EU country, don’t want to leave the EU. Nor do the other net-contributing countries, such as Germany and France. Since the UK referendum the popularity of the EU among the population of member countries has actually risen. Why is this if Brexit is such a good idea? Is it because other countries better understand that the money each country pays into the EU provides a net benefit in the form of tariff free trade in the single market, collaboration is scientific research, strong bargaining power in international trade negotiations, co-operation in defence and higher economic growth? There are also EU initiatives such Airbus and the £70bn EU scientific research funding programme. The latter supports nearly 6,500 UK-based scientists. UK scientists are among the largest beneficiaries of the EU research fund do to our world-leading scientific research at our universities. Between 2007 and 2013 the UK received £3bn more from the EU research budget than it had contributed. For a country to join the EU all existing member states have to agree to this and a number of countries are opposed to Turkey’s membership. Further, Turkey’s crackdown on opposition since the failed coup in 2016 has increased tension between the EU and Turkey. Since the referendum vote much of the talk from Brexit supporters has been about the “will of the people”, but hardly anything has been said about the benefits of leaving the EU. Blindly following the “will of the people” seems pointless if it significantly damages the UK economy and our international standing for little or no benefit. So, what are the economic benefits of Brexit? Brexit of course has not happened yet, but what have we seen so far? According to a study by the National Institute of Economic and Social Research the government’s Brexit deal will result in the UK being £100bn worse off a year compared to if it had stayed in the EU. The research estimates that the UK’s GDP will be 3.9% lower by 2030 because of Brexit. Revised data from the ONS shows that foreign direct investment (FDI) has “plummeted” as it fell from a £120bn surplus in the first half of 2016 to a £25bn deficit in the first half of 2017. The value of Sterling against the dollar and the Euro fell by over 10% following the Brexit result. It has not recovered and the pound is currently around 18% down against the Euro and 11% compared to the dollar since the referendum. Relative to other Group of 7 countries the UK has fallen from the fastest growing economy to the lowest growth country. In the first quarter of 2017 the dominant services sector (80% of output) barely grew, rising by just 0.1 per cent. This at a time when growth in the Eurozone accelerated. Inflation as measured by the Consumers Price Index has risen from 0.5% in June 2016 to 2.9% in August 2017. It is now the highest inflation rate among the world’s top economies. Adjusting for inflation, growth in earnings has fallen from 1.5 per cent in the 3 months before the referendum to negative in recent months. Real wages have fallen by 0.5 per cent over the last year. The UK savings ratio fell to a 53 year low in the first quarter of 2017 suggesting that consumer spending has been propped by people saving less and borrowing more. Unemployment is at a 40 year high but it is a concern that this has not resulted in any upward pressure on wages. Some of this rise has been due to an increase in self-employment where pay is on average lower than employed jobs. 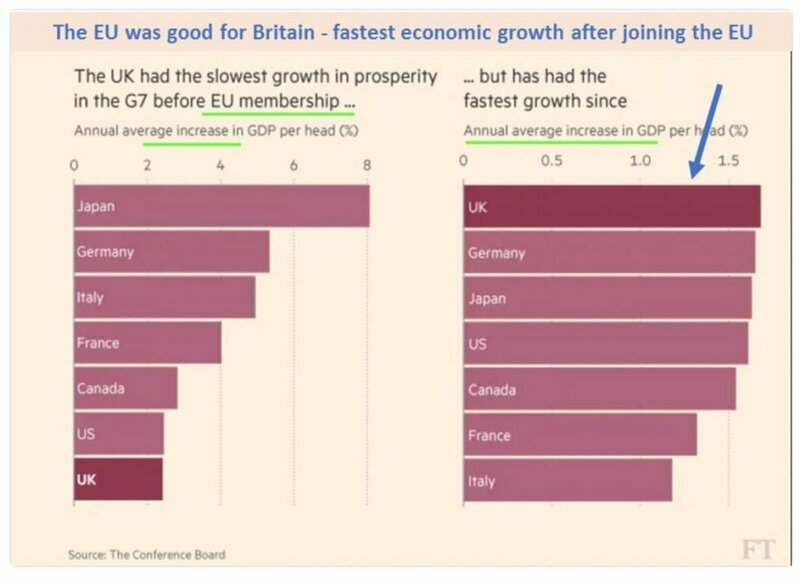 So, the data seems to contradict what the Leave campaign said about the economic benefits of Brexit. As the Mail on Sunday has admitted – “The promise that Brexit would be good for the UK economy has proved false.” The evidence also suggests that the UK economy has grown much faster since it joined the EEC/EU. 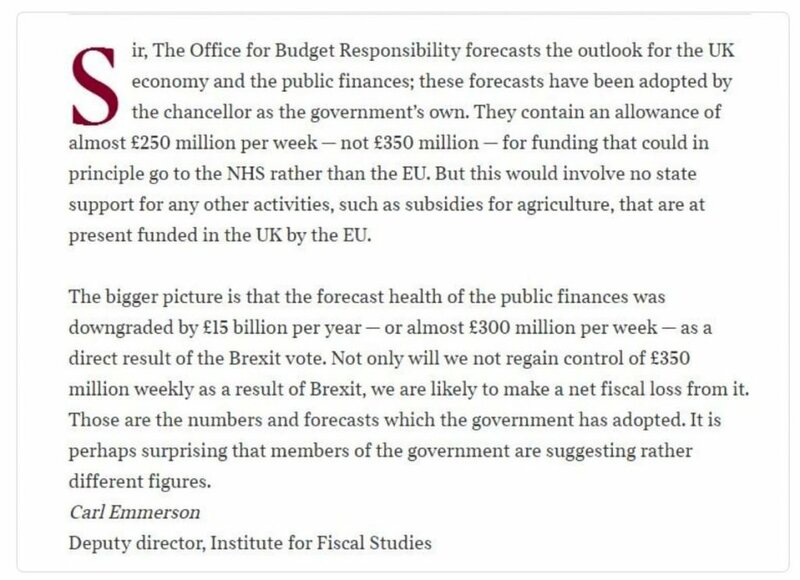 According to the Government’s own figures from the Office for Budget Responsibility (OBR) as a direct result of Brexit the forecast health of the public finances have been downgraded by around £15bn year or almost £300m a week. Given that the UK net contribution to the EU is around £276m a week the UK is likely to make a net fiscal loss from Brexit. The negotiations for leaving the EU are also proving slow and costly. A bill of £39bn to settle existing commitments has been agreed and if the government wishes to retain tariff free access to the single market we are likely to have to continue to pay a contribution to the EU. The imposition of tariffs of 300% by the US on Bombardier the Canadian aircraft maker which has a manufacturing facility in Northern Ireland shows how disruptive global trade can be when you are up against a major US manufacturer like Boeing. This demonstrates how difficult it maybe to get a comprehensive trade deal with the US after Brexit as the UK will not have the clout that the EU has when negotiating with a country like the US. Trump wants to put “America first” and he has already said he also wants a free trade deal with the EU. Will he really put the UK ahead of negotiating a much larger trade deal with the EU? Further, there are no trade deals that we were promised. This is because member states of the EU can’t negotiate trade deals whilst they are still in the EU. The EU has negotiated over 50 trade deals with countries outside the block and so the UK will need to replace all of these if it wants continue trading with these countries on the same terms as it currently does. This will take a huge amount of time and money to get new trade agreements in place. As Michael Heseltine recently pointed out – “There is no vision in Brexit. Brexit is without upside, there are no benefits.” Yet the costs and potential disruption of Brexit are huge. The Leave campaign argued that because EU countries export so much to the UK the EU would be obliged to offer the UK continued frictionless access to the single market. This claim has been totally undermined by the UK government’s insistence on ending freedom of movement of EU citizens and its intention to leave both the single market and the Customs Union. The EU’s inability to offer frictionless access to the single market is nothing to do with trying to teach the UK a lesson. It’s because the EU has no choice but to protect the integrity, credibility and legal security of the single market. This is because the single market is dependent upon freedom of movement of goods, services, capital and people and cherry picking between these freedoms is not allowed. Further, the single market was created to remove all regulatory obstacles to trade and requires member states to a strict set of conditions. This includes having uniform standards for goods and the EU court being the final arbiter in any disputes between member states. The credibility and legality of the single market depends on these conditions and this is why the only countries that have been given full or partial membership of the single market are the three members of the European Free Trade Association that are also members of the EEA. These states have agreed to the four freedoms and to be bound by the Efta court. Although membership of the EEA would be the best solution economically for the UK, it has decided not to pursue this option for political reasons. To obtain a free trade agreement the UK could aim for a deal similar to Ceta which the EU negotiated with Canada. This would allow the UK not to abide by EU laws or freedom of movement and it would be outside the customs union. Most goods would have tariff-free access to the EU market but like Canada, the UK financial services sector would not benefit from the EU banking passport. This means UK-based companies will have to move some operations to a location inside the EEA. Further, not having free access to the single market for services is a concern because 80% of the UK economy comprises services and only 20% is manufacturing. The free trade agreement with Canada also took seven years to negotiate and so it is likely that the UK will need more than two years for a transitional period. Why is it then that in 2016 Germany became China’s largest trading partner? How is it that France exports more to the USA than it does the UK? The EU also has more than 50 trade deals with countries outside the trading block. Fact – eighty percent of the UK economy is services. Manufacturing is not the driver of the UK economy that it was a long time ago. Maybe the UK economy needs re-balancing towards manufacturing, but leaving the EU won’t allow the UK to instantly switch resources to manufacturing. Perhaps the problem is that we don’t manufacture enough of what other countries want to buy. The productivity of UK workers is also significantly below that of our major trading partners and this is likely to be damaged by Brexit and the controls on immigration proposed by the Government. This means that the UK will struggle to be competitive in global markets unless we can improve productivity. So, leaving the EU won’t be a mythical world of global trade and wealth creation that many Brexit supporters suggest it will be. This is not supported by the facts and if anything the reverse is likely to be the case. Thank you for reading my post and if you believe in keeping the UK in the European Union please share this using the social media icons below. If you live in North Wales join our Wrexham for Europe Facebook group or donate using our crowding funding page here to show your support for the People’s Vote. Reasons for blocking Article 50 – Should MPs vote to stop Article 50? About the author: Neal Cole is a digital marketer who has worked in a number of European cities including Paris and London, and also in the British overseas territory of Gibraltar. He is the founder of Conversion Uplift Ltd which provides digital optimisation consultancy services and has worked for brands such as Deezer.com, Foxybingo.com, Very.co.uk, partypoker.com and Bgo.com.